Manoeuvre Parked Aircraft by Hand! Moving heavy rolls of paper, railway wagons, and even parked aircrafts by hand may sound like magic, but it is humanly possible! The unassuming "Easy Roller" works just as its name implies. With this device, you can easily manoeuvre up to 100 tons without exerting great effort. The secret lies within the device's utilization of the wheeled object's net mass to its own advantage. Without having to climb into the driver's cab or even turn on the engine, the mechatronics engineer can effortlessly manoeuvre the articulated lorry over the repair pit. It's not even necessary to know how to drive one! In one hand, the engineer holds the handle of the "Easy Roller". The air motor, which powers the transport system, is hardly audible. Moreover, it does not produce any exhaust fumes, thus proving to be environmentally sound. Aside from the usual odour associated with motor oils, employees in the workshop will not be exposed to harmful emissions. Finally, there is absolutely no risk of an explosion while operating the air motor. In a straightforward, yet ingenious manner, the "Easy Roller" acquires its power from the net mass of the wheeled equipment, and in doing so, moves forward. The transport device is positioned in front of the equipment, for example a heavy roll of cable. It operates on two rubber rollers, over which the drive roller is positioned. The front castor is pressed against the drive roller by springs. The rear section is initially comprised of free space. When the employee presses the manoeuvring valve handle, the air motor starts, thereby enabling the drive roller's chain-controlled backward motion. What happens? The drive roller transfers the movement to the front castor and the "Easy Roller" moves in the direction of the cable drum. Simultaneously, the device is pressed down in order to initiate contact between the drive roller and rear castor, thereby transferring the torque for the forward rotation. If the contact pressure of the rubber drive roller which continuously grinds with increasing momentum against the object, is strong enough, the torque will be transferred to the cable roll. The heavy cable roll moves and the object acquires a rolling motion. The air vane motor powering the drive roller is a small, compact powerhouse, which was developed and designed for this sole purpose by DEPRAG SCHULZ GmbH and Co. in Germany. The Bavarian specialist for air motors has been dealing with this mode of drive for several decades, and thus offers a diverse catalogue range detailing high quality air motors for all industry sectors. Project manager Dagmar Dübbelde asserts, "If there is not a standard motor available for the customer's specific application, our engineers will certainly find a solution with an appealing price-quality ratio in mind." The air vane motor described here features a capacity of 1.2 kW. With a length of 218 mm and a diameter of 100 mm, it only weighs 9.1 kg. It is right rotating, has an idle speed of 100 rotations per minute and a nominal torque of 500 Nm. Andreas Hufmann, managing director of Easy Roller GmbH in the Bavarian town of Feucht, recalls three reasons why his firm decided to use DEPRAG air motors: "These air motors have a unique price-quality ratio, possess a technical superiority not found elsewhere in the world, and Amberg is ideally situated on the outskirts of Nuremberg." What makes air vane motors the best option for powering the "Easy Roller"? There are many advantages in using air motors. Most importantly perhaps is their large power density. Depending on the model, they only require one-fifth of the electric motor's net mass or one third of the overall size. At various speeds, the performance delivered by the air motor, is almost constant. Thus, it can be optimally operated over a wide range of varying loads. The engine power is continuously controlled by throttling the air volume. The motor will never be overloaded. It withstands additional strains until brought to a standstill and runs effortlessly afterwards. This process can be carried out as many times as required. 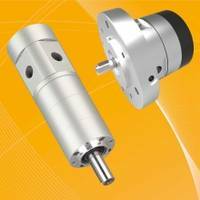 Air motors have a wide application spectrum due to the diverse number of models, the simple, yet frequently tried and tested design, the low net-weight, the vast speed range, and the explosion safety feature,. Air vane motors operate according to one basic principle. The air pressure, which is generated by a compressor and circulated by an air hose, moves the revolving rotor, which is encased in an eccentric cylinder. Vanes, which are found in its slots, are pressed outwards against the cylinder wall by the rising centrifugal force. This leads to the formation of chambers for the expanding air pressure. As the compressed air expands, the pressure energy subsequently transforms into kinetic energy, thereby producing the rotary motion. Air vane motors are resistant to heat and due to their mode of operation, they are well suited for use in critical environments. Through the decompression of the air, the air motor cools down and therefore overheating would be impossible. Thus, pressurised air is in itself an uncomplicated source of energy: there is no threat of danger associated with electrical connections of any kind. A wide variety of "Easy Roller" models are available from the transport equipment manufacturer, which are uniquely tailored for each specific use. Wheeled transport equipment with driving rollers, for example, are well suited for paper rolls in the paper and printing industry. With regards to moving vehicles, devices with grooved drive rollers ensure better rotation power. The transport device intended for aircraft and heavy vehicles is particularly efficient. For shunting railway wagons, the roller can be used in conjunction with a rail system in order to enable more mobility in the "Easy Roller's" work area. For transferring under floor rollers or cars, the transport system is equipped with a thrust bar, which enables forward movement or when necessary, movement in both directions. The "Easy Roller" is also capable of manoeuvring within industrial production plants. Flexibility is essential when it comes to full order books in this sector. 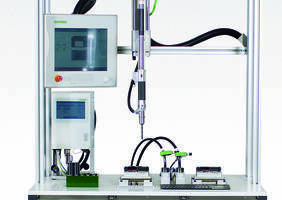 Once an order is complete, the parts of the production system are quickly and efficiently replaced. The powerful conveyor system, which is operated by only one person, assumes this task. With a torque of up to 1700 kp and a speed of 25 metres per minute, the "Easy Roller" can move the equipment to any number of places in the production hall. The consistent variable speed control of the transport device makes precise, controlled manoeuvring a piece of cake. Andreas Hufmann adds, "Moving objects with the help of "Easy Roller" increases safety for employees and decreases the chance of industrial accidents due to improper manoeuvring." With the "Easy Roller", the company specializing in roller transport devices, additionally offers inexpensive alternatives to permanently mounted automatic conveyor systems. Andreas Hufmann explains, "Automatic conveyor systems take up a great deal of space and are expensive to produce and maintain. Both of these factors do not apply to the "Easy Roller". With the utilization of our transport device, labours costs decrease and firm productivity increases." Easy Roller GmbH, which produces and markets the "Easy Roller", has their headquarters in Feucht, Germany. For the past several years, the firm has been involved in the development of transport devices. After their establishment at the beginning of 2009, they began preparations for international sales. Currently, there are five standard devices available for rolling, sliding, and manoeuvring. Other transport devices will be available in their standard program in the coming months. Andreas Hufmann greatly values the positive collaboration with DEPRAG SCHULZ GMBH u. CO. in Amberg, "The engineers at DEPRAG are available to help us at any time. In terms of consultation and customer service, no requests remain unfulfilled." The development and construction of high-quality air motors is one of the main areas of expertise of DEPRAG, a company with 600 employees and business operations in over 50 countries. The renowned specialist for air motors, automation, screwdriving technology, and air pressure tools, not only operates as a full-service provider for the utilization of air motors, but also for complete drive solutions. Decades of experience allow DEPRAG engineers to provide expertise and support for their clientele during the customisation of their individual motor design. EACY Feed Vibratory Feeder uses 24 V oscillating magnets. 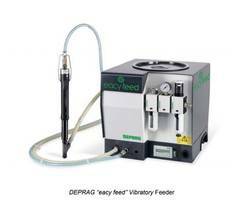 Adaptive Deprag Fastening System offers maximum torque of 15 Nm. Vibratory Bowl Feeder features independent, self-regulation. Transporter provides gap between consecutive conveyors.